A police car has come under attack in Larne’s Craigyhill estate. The windscreen was smashed and damage was caused to the bonnet and a door during the incident at Bengore Gardens, at 9.10 pm, on Monday night. 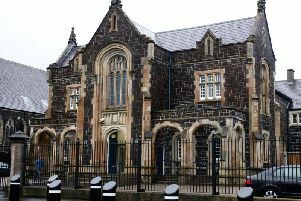 Chief Inspector Simon Ball said: “Officers were responding to a call from a member of the public on Monday July 31, at around 9.10pm, when their vehicle was attacked by a number of youths wearing ski masks in the Bengore Gardens area of Larne. “Stones were thrown at the car, resulting in a broken windscreen and damage to the bonnet and driver’s door. No officers in the vehicle were injured. “The investigation into this incident is at an early stage and police would ask anyone with information to contact police on the non-emergency number 101, quoting reference 1384 of 31/7/17.